©2016 Ian C. Esslemont (P)2016 Brilliance Audio, all rights reserved. the impressions of different races and monsters was great, very entertaining. cant wait for the next book! Ian Esselmont has hit his stride both as a writer and a story teller. 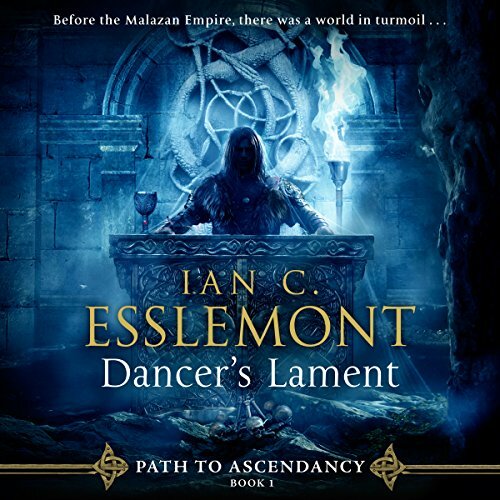 Dancer's Lament begins a rich development of Malazan history without coming across as a prequel. The relationships of the characters are unexpected and complex. The book stands on it's own without suggesting that the characters have a future in an epic series, so I believe it would be a great choice for someone who has never heard of Malazan Book of the Fallen. For those who have read and reread MBotF, what can I say... It's sweet. The reader, John Banks, is just right. Great voices with just the right emphasis in the right places. My only complaint is the voice of Koroll. I found it difficult to listen to when he talked very long, which fortunately was not very often. Otherwise, excellent. I enjoyed this book. It really kept me interested. The story wasn't too long and still you get enough depth of the characters and what is going on. Can't wait for the next book. This story has a large number of story arcs that make it difficult to get a grasp on where the overall story is going. However, if one stays with it, the various threads do begin to tie together and coalesce at the end. Even so, there was a large amount of time spent on character interaction and backstory such that maintaining one's interest level often became a challenge. I will say that the writing was above par and the narrator's performance was worthy. The worlds created by Ian C. Esslemont and Steven Erickson are beyond amazing! Every one of them have been intriguing, entertaining, captivating, and down right awe inspiring. Lots of action and really funny! It answers a hundred questions from the book of the fallen story, it poses a thousand new ones. From start to finish it was hard to put down. While I've enjoyed Erikson's Karkhanas (sp?) story, I never really cared about Anomander Rake's, and the Tiste Andii's, history. However, in a literary world with so many well written friendships/partnerships, one of my favorite has always been Shadowthrone and his Rope. While the two are woven throughout the Malazan Book of the Fallen, you don't really get an in-depth look at their relationship, and most of what you do get barely skims the surface of a much deeper, but only ever implied, back story. I was very excited to see their beginnings, and this beginning does not disappoint. It is easy to see why these type of books are so long. Everything is explained in extensive detail. Example, One guy is described as gulping like a fish in lake so and so in the county of so and so. Books like this love to rattle off names, I guess to make them seem more historical, legit, ?. It is a popular why to write, as a lot of fantasy novels do it. I get lost, wondering, should I know these names of a fictional place. Why could he not just say he gulped like a fish? I could not finish this book. I really enjoyed this book, but the narrator made me cringe. Either they didn't explain to him how to pronounce many names from the Malazan world correctly or he just made it up as he went along. He's also a bit overly dramatic in places. I found myself distinctly happy with this book. The writing was superb and the narrator really knocked this one out of the park. I'd tour I might have been a little burned out on this setting but this book really recharged my energies. Great book!! the book was amazing and I've listened to all the other Malazan empire series and loved them but for the first time I didn't give 5 stars because there was weird audio bugs in this one. the narrator would be mid sentence then just change pitch and you could tell that they had recorded the sentence in different sessions it was annoying.